Almost 40 years after its 1978 debut, the landmark play “Zoot Suit” has returned to the Mark Taper Forum. The play, which was the first Chicano show to go to Broadway, centers on the Sleepy Lagoon murder trial and the Zoot Suit riots of 1943. That summer, racial tensions exploded when American sailors set out to attack young Mexican-American men blamed for an uptick in violence. These young Chicanos had adopted as their signature look the zoot suit – a stylish, baggy outfit that had been made popular by jazz musicians in New York. On Monday, February 12, KPCC in Person in collaboration with KPCC’s The Frame presented a conversation around this historic play. Luis Valdez, writer-director of the original and revival productions, joined host John Horn at the Mark Taper Forum along with Center Theatre Group artistic director Michael Ritchie, original and revival cast member Rose Portillo and Pomona College history department chair Tomás F. Summers Sandoval, Jr. 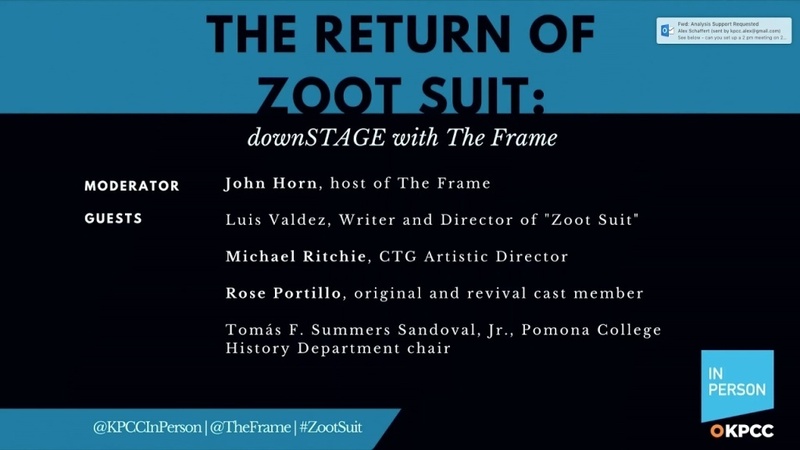 The panel discussed the history of the zoot suit and its place in Chicano identity, the significance of the play as new American theater –then and now – and the ability of theater to bring people of all backgrounds and ethnicities together. When asked how he first learned of the Zoot Suit riots and when they became the inspiration for his play, Valdez told the audience about his family ties to the pachuco subculture of the 1940s. “Zoot Suit,” Valdez explained, is dedicated to his cousin Billy, who Valdez said met “a violent pachuco’s death” in 1955. Valdez also told the crowd about one of Billy’s charismatic friends; it’s a story with a delightful twist. Valdez and Summers Sandoval, Jr. discussed the evolution and significance of the zoot suit – how it made its way from the Harlem jazz scene to L.A.’s Chicano community, what it meant to the pachucos who wore it and what it felt like to have it stripped off. Portillo, a cast member in the original and revival productions at the Mark Taper Forum, discussed what the play means to audiences today versus what it meant in 1978, in her view. Whereas in 1978, the play created “an opportunity for cleansing” for many audience members with personal connections to the tensions and discrimination of the 1940s, she said, now audiences want to share the story with their broader community of non-Latino friends and neighbors. During the Q & A, an audience member with a special connection to the original production approached the mic.